WrestleMania IV was the fourth annual WrestleMania professional wrestling pay-per-view (PPV) event produced by the World Wrestling Federation (WWF). It took place on March 27, 1988, at the Historic Atlantic City Convention Hall[a] in Atlantic City, New Jersey. The announced attendance of the event was 19,199, drawing a 6.5 buyrate on PPV. What the World is Watching! The main event featured as the finals of a one-night fourteen-man single elimination tournament for the Undisputed WWF Heavyweight Championship, in which Randy Savage defeated Ted DiBiase to win the vacant title. The main matches on the undercard were a twenty-man battle royal won by Bad News Brown, Demolition (Ax and Smash) versus Strike Force (Tito Santana and Rick Martel) for the WWF Tag Team Championship, and Brutus Beefcake versus The Honky Tonk Man for the WWF Intercontinental Heavyweight Championship. WrestleMania IV was a professional wrestling event held by the World Wrestling Federation, and was the fourth iteration of WrestleMania, first held in 1985. The event was held March 27, 1988, at the Historic Atlantic City Convention Hall, Atlantic City, New Jersey. This event along with WrestleMania V would be advertised as being held at the Trump Plaza Hotel and Casino, with both events taking place across the road at Convention Hall, but sponsored by Donald Trump. The two events would be the only time that WrestleMania would be held at the same venue in consecutive years. The attendance for the event was announced as 19,199, who paid a total of $1,400,000 in admission fees, however was significantly reduced from that of the previous year's event, which sat at 93,173, and would stay similar to the following year 20,369. Having previously faced off in the previous years main event, much of the promotion of the event featured the continued rivalry of Andre the Giant and Hulk Hogan. This would take place inside of a single elimination ten-man tournament, for the vacant world championship. The event was broadcast across closed circuit television to 175,000 homes, and also on pay-per-view (PPV) drawing a 6.5 byrate, which was reduced from 8 the previous year. WrestleMania IV featured a card, which contained matches that involved different wrestlers from pre-existing scripted feuds, plots and storylines. Wrestlers portrayed either a villainous or fan favorite gimmick as they followed a series of events which generally built tension, leading to a wrestling match. The name of a wrestler's character was not always the person's birth name, as wrestlers often use a stage name to portray their character. As a narrative, events are usually pre-planned in order to promote a show, or match. The main plotline for the event featured a ten-man tournament, including a rematch of WrestleMania III's main event. 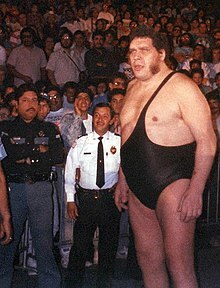 André the Giant (pictured) and Hulk Hogan would meet in the quarter-finals of the championship tournament, having headlined the event the year prior. The most heavily promoted feud heading into the event was between Hulk Hogan and André the Giant, similar to the year before when the two met at WrestleMania III. In January 1987, Hogan was awarded a trophy for his third year as WWF World Heavyweight Champion while Hogan's on-screen friend André was awarded a smaller trophy than Hogan's, for being undefeated in the WWF for the previous fifteen years. Hogan congratulated André over winning the award, but André exited the arena before Hogan's speech was finished. In February, on an episode of Piper's Pit, André announced his new manager, Bobby Heenan, Hogan's longtime on-screen rival. Hogan asked André to leave Heenan, to which André refused. André then challenged Hogan to a WWF World Heavyweight Championship match at WrestleMania III, before ripping off Hogan's Hulkamania shirt and golden cross necklace, turning from an on-screen hero to villan (heel). At WrestleMania III Hogan defeated André to retain the title. At the first Survivor Series in November 1987, André along with team members, One Man Gang, King Kong Bundy, Butch Reed and Rick Rude defeated Hogan, Paul Orndorff, Don Muraco, Ken Patera and Bam Bam Bigelow in a traditional Survivor Series match. Shortly after Survivor Series, Hogan defended his WWF World Heavyweight championship against Bundy, André sneak-attacked Hogan, applying a choke hold. Ted DiBiase, a relative newcomer to the WWF, was portrayed as "The Million Dollar Man", an evil millionaire, offered Hogan a large sum of money to sell DiBiase the WWF World Heavyweight Championship, to which Hogan refused. At the first Royal Rumble in January 1988, Hogan and André had an official contract signing for a WWF World Heavyweight Championship rematch. Their rematch took place on the first edition of The Main Event in February, where André defeated Hogan with a dusty finish. André won the match when referee Dave Hebner's identical twin Earl Hebner made the decision. Shortly after being awarded the championship, André would kayfabe sell the title to DiBiase. Whilst André's championship reign is recognised by the WWF, DiBiase would be stripped of the title. Plotwise, WWF President Jack Tunney vacated the title due to it having not been won in a sanctioned match and ordered it to be decided in a single elimination 14-man tournament at WrestleMania IV. As previous champions, André and Hogan would get a bye to the second round of the tournament, but would face each other in their second round matchup. Hogan would form an unlikely alliance with former enemy and top challenger to his WWF World Heavyweight Championship, Randy "Macho Man" Savage (which was later known as the Mega Powers). Savage had been portrayed as an egomaniacal heel during most of his first two years in the WWF, but in the late summer of 1987 began to slowly turn face. Their on-screen friendship, then, was formed when Hogan (at the persuasion of Savage's valet, Miss Elizabeth) intervened when Savage was being attacked by The Honky Tonk Man, and the Hart Foundation in an angle. Although Hogan and Savage teamed together at un-televised house shows, nothing more was made of it on national television until shortly before WrestleMania IV, when Hogan rescued Savage a similar angle featuring Andre, DiBiase and Virgil. Lower on the card, Brutus Beefcake was challenging for the WWF Intercontinental Championship, held by The Honky Tonk Man. Beefcake - who had the gimmick of that of a haircutter would regularly cut wrestler's hair after matches - had previous experience of Honky, and had vowed "to cut his ducktail hair." Honky, meanwhile, was portrayed as a cowardly champion, frequently relying on outside interference from manager Jimmy Hart or on-screen girlfriend Peggy Sue to win matches, or intentionally getting himself counted out or disqualified to retain his championship with the champions advantage. Having debuted the year previously, in his first major feud, The Ultimate Warrior began battling with Hercules over which character was the stronger, gladiatorial-style superstar was in the WWF. During a match on WWF television, Hercules attacked Warrior with his steel chain after a chain match in an angle. The British Bulldogs and The Islanders had feuded since the late fall of 1987. The Islanders would take the Bulldogs' mascot, Matlida the bulldog, from ringside. Bobby Heenan, manager of the Islanders commented on the legality of having animals at ringside, remarked on Koko B. Ware's macaw Frankie who accompanied him to ringside. This would lead to a Six-man tag team match with manager Heenan tagging with the Islanders against the Bulldogs and Ware. WrestleMania IV's coverage began with Gladys Knight singing a rendition of "America the Beautiful". In the first match of the pay-per-view event was a twenty-man over the top rope battle royal. [b] The winner of the match would receive a trophy. After fourteen eliminations, the final six participants were Bad News Brown, Bret Hart, Paul Roma, Harley Race, Jacques Rougeau, and Junkyard Dog. Race hit a back body drop on Rougeau sending him over the top rope before Junkyard Dog punched him over the top rope. Brown eliminated Roma as Junkyard Dog was left to battle Hart and Brown. The duo double teamed Dog before Brown attempted a clothesline on Dog but hit Hart instead. Junkyard Dog hit both men with several headbutts before they both decided to cooperate and they eliminated Junkyard Dog. After eliminating Dog, Hart indicated that he and Brown would share the trophy; however, Brown caught Hart with his Ghetto Blaster before eliminating him over the top rope to win the battle royal. Brown was presented with the trophy, but Hart interrupted and hit Brown with the trophy. Hart and partner Jim Neidhart would later turn babyface over the next few months. Before the fourteen-man tournament for the WWF World Heavyweight Championship began, Robin Leach from the TV show "Lifestyles of the Rich and Famous" outlined the background for the tournament, and how the championship was vacated. In the first round, "The Million Dollar Man" Ted DiBiase (with bodyguard Virgil and André the Giant) defeated "Hacksaw" Jim Duggan by pinfall. "The Rock" Don Muraco (with Superstar Billy Graham) defeated Dino Bravo (with Frenchy Martin) by disqualification after Bravo pulled the referee in front of him, causing the referee to be hit by a flying forearm from Muraco. "Macho Man" Randy Savage (with Miss Elizabeth) defeated "The Natural" Butch Reed (with Slick), Greg "The Hammer" Valentine (with "The Mouth of the South" Jimmy Hart) defeated Ricky "The Dragon" Steamboat, the One Man Gang (with Slick) defeated Bam Bam Bigelow (with Oliver Humperdink), and "Ravishing" Rick Rude (with Bobby "The Brain" Heenan) fought Jake "The Snake" Roberts to a time limit draw. The winners of these matches advanced to the quarterfinals. As Rude and Roberts tied, they were both eliminated from the tournament, thereby giving the One Man Gang a bye into the semifinals. As former champions, André the Giant and Hulk Hogan were given a bye and had directly qualified next round. In his PPV debut, The Ultimate Warrior faced Hercules. The pair locked up with Warrior chopping Hercules in the corner. Hercules fought back as he hit two clotheslines on Warrior, who no-sold them before a third from Hercules took Warrior off his feet. Warrior then countered a Hercules clothesline and hit a clothesline of his own. In the corner, Warrior hit him with ten punches, but while Warrior was looking at the referee, Hercules hit an inverted atomic drop. He then tried to apply his finishing move, a full-nelson but could not lock his fingers behind Warriors head. The Warrior then pushed his feet off the top turnbuckle and both men fell to the mat with both men being pinned. Warrior lifted a shoulder before the end of the count, awarding Warrior the win. The first of three quarterfinals saw Hulk Hogan take on André the Giant. During the match, Hogan hit André with a chair in front of referee Joey Marella. André would retaliate, grabbing the chair hitting Hogan. After both men hit each other with the chair, they both were disqualified by Marella and, as a result, they both were eliminated from the tournament. The second quarterfinal saw Ted DiBiase (without either André or Virgil after Virgil had been Suplexed in the aisle by Hulk Hogan) defeated Don Muraco by pinfall. With both of André and Hogan disqualified, DiBiase would get a bye to the final. The third quarterfinal saw Randy Savage defeat Greg Valentine also by pinfall. As One Man Gang had received a bye in the quarter-finals due to Rick Rude and Jake Roberts having wrestled to a time limit draw in the first round Gang would face the Savage in the semi-finals. Brutus "The Barber" Beefcake fought WWF Intercontinental Champion The Honky Tonk Man for the Intercontinental championship. Early in the match, Beefcake connected with an atomic drop at the outset of the matchup. Beefcake then hit Honky with a high knee, before missing an elbow drop on Honky, who took control with a second turnbuckle fist drop. Honky went for his Swinging neckbreaker called Shake, Rattle & Roll on Beefcake but instead Beefcake kneed him in the face. Beefcake would put Honky in a sleeper hold. With Beefcake in charge of the match, Honky's manager Jimmy Hart hit the referee with his megaphone. The bell didn't ring but it was announced that Beefcake won by disqualification, which meant that Honky was still the champion. [c] Post-match, with Honky Tonk apparently knocked out in the ring, Beefcake cut the hair of Hart with his barber shears. The Islanders (Haku and Tama) and manager Bobby Heenan took on The British Bulldogs (Davey Boy Smith and Dynamite Kid) and Koko B. Ware in a six-man tag team match. Dynamite and Tama started the match with Dynamite catapulting Tama over the top rope. Smith tagged in but missed an elbow drop on Tama, allowing Tama to tag Haku. Smith hit a flying crossbody on Haku for a near-fall. Haku hit an arm wrench and tagged Tama. Tama grabbed Smith's arm and came out of it with a military press slam. Tama tagged in Haku who put Davey in a backbreaker but Smith flipped out of it and tagged in Koko. He hit Haku with a missile dropkick and a Frankensteiner. Dynamite tagged in and clotheslined Haku before ran into Haku's boot. As a cowardly manager, Heenan tagged and stomped Dynamite before quickly tagging out to Tama. Tama hit a back body drop on Dynamite but missed a big splash to allow Dynamite to tag Koko whilst Tama tagged Haku. Both members of the Islanders would square up to Koko prompting the Bulldogs to enter the ring. All six men brawled in the ring before being separated by the referee, who ordered the Bulldogs into their corner. The Islanders used this distraction to pick up Heenan and throw him onto Koko, leading to a pinfall victory. Next, Randy Savage faced One Man Gang for a place in the final of the tournament. Ted DiBiase had already received a bye in the semi-finals due to the double disqualification of Hulk Hogan and André the Giant, and would meet the victor. Savage hit a hotshot on the One Man Gang, but Gang quickly took control of the match. Gang would attempt a 747 splash, but miss after Savage dodged and later fell to the outside as Savage connected with a diving double axe handle. Savage then went for a scoop slam which failed. One Man Gang's manager Slick jumped on the apron and handed One Man Gang a cane; which he hit Savage with and attempted to jab him as he lay on the mat but Savage kept rolling away. The referee caught Gang using his cane and disqualified him and awarded the match to Savage. Before the final round, Strike Force (Tito Santana and Rick Martel) defended the WWF World Tag Team Championship against Demolition (Ax and Smash) with their manager Mr. Fuji in their corner. The match started with Strike Force hitting Smash with a double back elbow for a near-fall. Santana applied an armbar on Ax before Martel tagged in and applied an armbar but Ax headbutted him and tagged out to Smash. Santana tagged in but was caught in a bear hug and was clotheslined by Ax, before a scoop slam and suplex on Santana. Santana hit a flying forearm smash on an interfering Smash and tagged in Martel who dropkicked both Ax and Smash a number of times and applied a Boston crab on Smash. Santana grabbed Mr. Fuji up onto the apron, allowing Ax to get his manager's cane. He nailed Martel with it as Smash covered Martel with a pin. As a result, Demolition won the match, and the WWF Tag Team Champions. The main event of WrestleMania IV was the tournament final for the vacant WWF World Heavyweight Championship between "Macho Man" Randy Savage and "The Million Dollar Man" Ted DiBiase.DiBiase was accompanied to the ring by Andre The Giant, whilst Savage his regular valet Miss Elizabeth. Savage had wrestled three prior matches, whilst DiBiase had wrestled one less, received a bye from the quarterfinals. DiBiase controlled much of the match, before a fightback from Savage, and attempted a top rope elbow drop on DiBiase but DiBiase moved out of the way. DiBiase applied a Million Dollar Dream submission on Savage. To aid Savage, Elizabeth would go backstage and bring Hulk Hogan to ringside to neutralize André being at ringside. André the Giant would interfere in the match on behalf of DiBiase, and whilst the referee was distracted, Hogan would attack DiBiase with a steel chair. Savage climbed up the top rope for a second elbow drop attempt and hit the Savage Elbow. He followed it up with a pinfall victory. He won the tournament and the vacant WWF World Heavyweight Championship. After the match, Hogan, Elizabeth and Savage celebrated Savage's WWF Championship win. This show could have been so much better had they trimmed the tournament down to eight guys from fourteen. WrestleMania IV received mixed to poor reviews from critics. Most reviews criticized the show's length as well as the number of matches. Rob McNew from 411Mania.com gave the show a 3.5/10 rating when reviewing the show, claiming the show was "bad". McNew was frustrated by the number of matches on the show, and the size of the tournament, saying "This show could have been so much better had they trimmed the tournament down to eight guys from fourteen. Instead we got a bunch of short matches, none of which ended up being memorable. The show had its moments, and isn't all terrible. Just way too long. Savage-Dibiase provides a great moment, but the rest of the show is a pass." Retoprowrestling.com were also highly critical of the show's length, calling it "a chore to watch", and that "there's probably nothing wrong with a wrestling pay per view running nigh on four hours, but when about three and a half of those hours don't actually feature much in the way of entertainment, it often feels like you've spent your entire weekend just watching this one show." John Canton of TJR wrestling called the event "a below average show", citing the event being "a 16 match card. That’s too many matches." Canton also commented on the length of these matches, and primary usage of "rest holds", and bad finishes. Bryan Rose from Voices of wrestling called the show a "dud", before stating there was a "lot of nothing for 3 1/2 hours." Rose also suggested similarities that the event's length had to watching two Godfather films. Mike Powell of prowrestling.net called the event "really bad", and commented that had the show been less than three hours in length, rather than 4, it would have been an allround better show. However, John Powell, from SLAM! Wrestling called the event "excellent", saying that the show's greatness comes from its unpredictability. Powell, says that the show was "another tricky venture for Vince McMahon and he hits the jackpot again." Powell was very positive about the show's tournament, stating that it and Savage's title win was the highlights of the night. Bret Mix from Wrestling DVD Network commented on the structure of the event, before calling the event "average", but "underrated" for its high quality of matches throughout the show, despite the number of matches. As an event in the annual WrestleMania series of events, WrestleMania IV is considered to be one of the weaker events; with reviews commenting that the event was mostly notable for a year long feud between Randy Savage and Hulk Hogan that preceded the event, with the two facing off a year later at WrestleMania V. Scott Keith of SmarK rant gave the event a "recommendation to avoid", and commented it was "long, boring (and) dull", and that the event was simply to "serve as a prelude to WrestleMania V"
In the months that followed the event, Savage defended the WWF World Heavyweight Championship on multiple occasions, primarily against DiBiase but also granted title shots to others such as the One Man Gang and Bad News Brown. Hogan, meanwhile, took a leave of absence from the WWF during the late spring and part of the summer to film the movie No Holds Barred. André the Giant was shortly placed in a feud with "Hacksaw" Jim Duggan, however, the DiBiase-André alliance was renewed when the two attacked Savage during a television taping for the WWF's syndicated show Superstars of Wrestling. DiBiase and Andre would offer a tag team match to Savage at the inaugural SummerSlam, where Savage would chose to partner Hogan and create the "The Mega Powers". The team of Hogan and Savage won the match before Savage would turn heel against Hogan at The Main Event. Hogan would challenge Savage for the WWF World Heavyweight Championship at WrestleMania V, with Hogan winning the title. Having interfered in Duggan's match at the event, Hacksaw confronted André, and attack him with his 2x4. This storyline would come to an end before Superstars of Wrestling. Having wrestled to a time limit draw in the championship tournament, Jake Roberts and Rick Rude were placed into a fued regarding Rude making kayfabe advances over Robert's real life wife, Cheryl. The Honky Tonk Man continued to feud with Brutus Beefcake over the Intercontinental Heavyweight Championship during the spring and summer of 1988, with Honky retaining the championship by being intentionally counted out or disqualified on multiple occasions. Beefcake was granted a "final" match at SummerSlam, but was sneak attacked by Ron Bass one week before the event. Honky would then lose his championship at Summerslam to a returning Ultimate Warrior. Demolition would defend the tag team championships against both Strike Force and The British Bulldogs. The Demolition-Strike Force feud came to an end in June 1988 when, during a televised match, Ax and Smash kayfabe injured Rick Martel by repeatedly using their finishing move, the "Demolition Decapitation" on him. Following this, The British Bulldogs and The Young Stallions, and later another power team, The Powers of Pain (The Barbarian and The Warlord), became Demolition's primary challengers. Following Bret Hart's elimination from the battle royal, he returned to the ring to challenge Bad News Brown. Bret would see a face turn, alongside partner Jim Neidhart. The pair would also engage in a new fued with The Fabulous Rougeaus. WrestleMania IV was later released on VHS, and would become the only WrestleMania event to be released over two VHS tapes. The event would later be released in 2014 on the WWE Network. ^ a b The venue was referred to as the Trump Plaza Hotel and Casino during the broadcast. ^ The participants were Bad News Brown, The Bolsheviks (Nikolai Volkoff and Boris Zhukov), The Hart Foundation (Bret Hart and Jim Neidhart), The Killer Bees (B. Brian Blair and Jim Brunzell), Danny Davis, George Steele, Harley Race, Hillbilly Jim, The Rougeau Brothers (Jacques and Raymond), The Young Stallions (Paul Roma and Jim Powers), Junkyard Dog, Ken Patera, Ron Bass, Sam Houston, and Sika. ^ Like other professional wrestling championships, they can only be won or loss by pinfall, submission or knockout unless stated in the stipulations placed before the match. ^ The other participants included were: Boris Zhukov, Brian Blair, Danny Davis, George Steele, Harley Race, Hillbilly Jim, Jacques Rougeau, Jim Brunzell, Jim Neidhart, Jim Powers, Junkyard Dog, Ken Patera, Nikolai Volkoff, Paul Roma, Raymond Rougeau, Ron Bass, Sam Houston, and Sika. ^ a b "WrestleMania IV". WWE. Archived from the original on March 17, 2018. Retrieved March 17, 2019. ^ "WrestleMania IV Review | 411MANIA". 411MANIA. Archived from the original on April 13, 2018. Retrieved March 19, 2019. ^ "WWE WrestleMania 30: Catch up on the past 29 WrestleManias here". The Independent. Archived from the original on November 1, 2014. Retrieved March 21, 2019. ^ "WrestleMania IV event venue: Trump Plaza". WWE. Archived from the original on February 10, 2018. Retrieved March 19, 2019. ^ a b "WRESTLEMANIA Part 1". FOX Sports. Archived from the original on June 21, 2017. Retrieved March 21, 2019. ^ "How the L.A. Coliseum persuaded WWE to bring WrestleMania to Los Angeles". ESPN.com. Archived from the original on February 6, 2019. Retrieved March 21, 2019. ^ a b "WWE WrestleMania". prowrestlinghistory.com. Archived from the original on August 17, 2012. Retrieved March 20, 2019. ^ a b c d "WrestleMania IV". TWM Wrestling News. Retrieved March 19, 2019. ^ a b c d e McAvennie, Mike (March 30, 2007). "The Big One". WWE. Archived from the original on October 15, 2007. Retrieved May 27, 2008. ^ "Andre the Giant loomed large over Wrestlemanias". canoe.com. Archived from the original on July 25, 2017. Retrieved March 21, 2019. 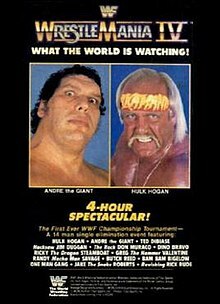 ^ "André the Giant vs. Hulk Hogan – WWF Championship". WWE. Archived from the original on January 16, 2006. Retrieved May 27, 2008. ^ "André the Giant, One Man Gang, King Kong Bundy, "The Natural" Butch Reed & "Ravishing" Rick Rude def. Hulk Hogan, Bam Bam Bigelow, "Mr. Wonderful" Paul Orndorff, Don Muraco & Ken Patera". WWE. Archived from the original on March 31, 2008. Retrieved June 1, 2008. ^ "Royal Rumble 1988". The Powerdriver Review. February 12, 1988. Archived from the original on July 14, 2008. Retrieved June 1, 2008. ^ a b "Saturday Night Main Event - Feb. 05, 1988". WWE. Archived from the original on November 7, 2017. Retrieved March 20, 2019. ^ a b c "André the Giant's first WWF World Heavyweight Championship reign". WWE. Archived from the original on June 24, 2005. Retrieved June 1, 2008. ^ "WWF World Heavyweight Championship". Complete WWE. Archived from the original on April 5, 2008. Retrieved June 1, 2008. ^ a b c d Greer, Jamie Greer (February 3, 2019). "30 Years Ago Today: The Mega Powers EXPLODE - Last Word on Pro Wrestling". Last Word on Pro Wrestling. Retrieved March 19, 2019. ^ a b c "The Summer of Savage: Inside the Macho Man's explosive run to the top of WWE, 30 years later". CBSSports.com. August 16, 2018. Archived from the original on August 17, 2018. Retrieved March 20, 2019. ^ a b c d e f g h i "WrestleMania IV results". Wrestling Supercards and Tournaments. Archived from the original on March 29, 2007. Retrieved May 31, 2008. ^ a b c d e f g h i j k "WrestleMania IV". The Powerdriver Review. February 12, 2008. Archived from the original on April 3, 2008. Retrieved May 31, 2008. ^ a b c d e f g "VIP AUDIO 5/20 – You, Me, and Wrestling with Cameron Hawkins: Guest Colin Richard provides a detailed account of WrestleMania IV, outlining fandom as a kid growing up during late '80s WWF (81 min) -". pwtorch.com. Retrieved March 20, 2019. ^ a b c d e f g h i j k l m "WrestleMania IV official results". WWE. Archived from the original on August 8, 2017. Retrieved August 6, 2014. ^ "Revisiting the Thanksgiving tradition that started at Survivor Series 1987". ESPN. Archived from the original on February 1, 2018. Retrieved March 21, 2019. ^ "PWTorch.com - Nostalgia Review: Wrestlemania 4; Savage vs. DiBiase, Savage vs. Steamboat, Hogan vs. Andre". pwtorch.com. Archived from the original on March 3, 2016. Retrieved March 24, 2019. ^ Kreikenbohm, Philip. "Overview « Inside The Cage Classics #6: WrestleMania IV – Die Krönung des Macho Man « Columns « Articles Database « CAGEMATCH - The Internet Wrestling Database". cagematch.net. Retrieved March 21, 2019. ^ "Rick Martel's Wrestlemania memories". canoe.com. Archived from the original on February 3, 2019. Retrieved March 21, 2019. ^ a b "Powell's WrestleMania 4 review: 14-man tournament for the vacant WWF Championship, Strike Force vs. Demolition for the WWF Tag Team Championship, 20-man battle royal". prowrestling.net. April 3, 2014. Archived from the original on April 14, 2018. Retrieved April 12, 2018. ^ "Daily Pro Wrestling History (03/27): WWF WrestleMania IV". WON/F4W - WWE news, Pro Wrestling News, WWE Results, UFC News, UFC results. Archived from the original on March 28, 2017. Retrieved March 21, 2019. ^ a b c "WWE WrestleMania Top 10 Performer Series: Randy "Macho Man" Savage". WON/F4W - WWE news, Pro Wrestling News, WWE Results, UFC News, UFC results. Archived from the original on June 20, 2017. Retrieved March 24, 2019. ^ Ted DiBiase with Caiazzo, Tom (2008). Ted DiBiase: The Million Dollar Man. Pocket Books. p. 11. ISBN 978-1-4165-5890-3. ^ a b "Randy Savage vs. Ted DiBiase WWF Championship Tournament Finals". WWE. Archived from the original on March 29, 2008. Retrieved May 31, 2008. ^ a b c McNew, Rob (March 10, 2009). "WrestleMania IV Review". March 10, 2009. Archived from the original on April 13, 2018. Retrieved April 13, 2018. ^ a b "PPV REVIEW: WWF Wrestlemania 4". retroprowrestling.com. February 25, 2013. Archived from the original on April 13, 2018. Retrieved April 13, 2018. ^ a b Canton, John (March 1, 2015). "TJR Retro: WWE WrestleMania 4 Review". TJR Wrestling. Archived from the original on April 14, 2018. Retrieved April 13, 2018. ^ Rose, Bryan (November 7, 2014). "Depths of Mania: WWE WrestleMania IV Review". Voices of Wrestling. Archived from the original on November 27, 2017. Retrieved April 13, 2018. ^ a b c Powell, John. "SLAM! Sports - Wrestling". slam.canoe.com. Archived from the original on April 13, 2018. Retrieved April 13, 2018. ^ "Review: WWF/WWE Wrestlemania 4 DVD". Wrestling DVD Network. May 17, 2010. Archived from the original on April 14, 2018. Retrieved April 13, 2018. ^ Keith, Scott (March 10, 2017). "The SmarK Rant for WWE Wrestlemania 4 | Inside Pulse". insidepulse.com. Archived from the original on April 14, 2018. Retrieved April 13, 2018. ^ "10 Things You Didn't Know About No Holds Barred". BULLETPROOF ACTION. Archived from the original on July 6, 2018. Retrieved March 24, 2019. ^ "Mega Powers Profile". Online World of Wrestling. Archived from the original on June 29, 2009. Retrieved February 8, 2011. ^ "The Main Event II results". Wrestling Supercards and Tournaments. Archived from the original on June 19, 2008. Retrieved June 10, 2008. ^ a b "Hulk Hogan vs. Randy "Macho Man" Savage – WWF Championship". WWE. Archived from the original on March 27, 2008. Retrieved June 10, 2008. ^ "WWE WrestleMania IV: What Went Wrong?". Camel Clutch Blog. Archived from the original on March 1, 2016. Retrieved March 19, 2019. ^ "WrestleMania IV official results". WWE. Archived from the original on May 25, 2011. Retrieved April 12, 2009. ^ Hart, Bret (2007). Hitman: My Real Life in the Cartoon World of Wrestling. p. 223. ISBN 978-0091932862. ^ "WWE To Release Limited Edition VHS Version of WrestleMania 31 – Full Details!". Wrestling DVD Network. Archived from the original on July 17, 2017. Retrieved March 20, 2019. ^ Lieberman, David. "WWE Sets February 24 Launch Date For Online Network". Deadline. Archived from the original on May 21, 2018. Retrieved March 20, 2019. ^ "WWF World Title Tournament 1988". Wrestling Supercards and Tournaments. Archived from the original on June 16, 2008. Retrieved June 10, 2008. ^ "THIS DAY IN HISTORY: WRESTLEMANIA IV, THE FIRST CLASH, BRODY WINS HIS LAST MAJOR TITLE, HALL OF FAME AND MORE | PWInsider.com". pwinsider.com. Archived from the original on September 8, 2015. Retrieved March 21, 2019. ^ "WWE Title Tournaments". prowrestlinghistory.com. Archived from the original on June 16, 2008. Retrieved March 17, 2019.